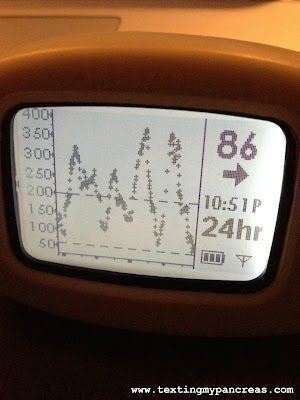 Texting My Pancreas: Diabetes and Batman. I will not let wonky, impossibly stubborn, unpredictable numbers thwart my exercise efforts. I will not beat myself up over this. And that, my friends, is why I don't think A1Cs are all that meaningful. I just want to say thank you for sharing a dex pic that isn't all pretty... Mine looks like that quite a bit and just the other day I was feeling down on myself because everybody else's dexcom NEVER looks like mine... THANK YOU! We are so on the same page! Thanks for sharing, and helping this D-gal feel a bit better about the M's and W's on d-logs and graphs. That looks familiar! My health insurance has a "wellness" program where a "certified diabetes educator" calls me monthly. Everytime she asks, "Have your blood sugars gone below 70 or above 140?" After I am done being dumbfounded I say, "Occasionally." Thanks for sharing! I get that same question! And when you say that you have, they must look at their canned response choices and then ask "did you forget to take your insulin or eat a high carb meal?" I just lie now and say no. Hey, that looks like my numbers!